The right furniture accent can be that final missing ingredient that pulls an entire room’s décor together. 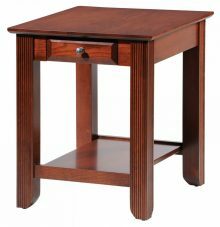 AmishOutletStore.com is your one-stop online headquarters for a tremendous selection of beautiful Amish End Tables that provide the perfect combination of form and function. Choose from a wide range of attractive styles including Madison, Albany, Buckingham, Lakewood and many others. If you’ve been dissatisfied with the lack of durability in poorly-made furniture you may have purchased at a big-box store or bargain outlet, you’ll be pleased with the high quality provided by our handcrafted Amish pieces. Choose from attractive, long-lasting hardwoods such as oak, cherry and maple — some of the sturdiest materials used in furniture making today. Our Amish master crafters still make furniture the old-fashioned way: one piece at a time and completely by hand. You’ll experience a level of quality that cannot be replicated by mass-production furniture manufacturing processes. 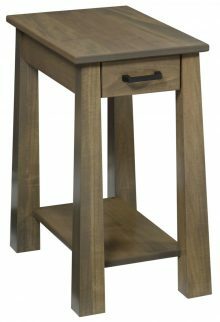 Every home is different, and to accommodate our customers’ wide ranges of décor, we offer many different types of solid wood Amish end tables. Whether you have a country-style home or a more contemporary one, we have a design that will complement your current furniture. Color. You may want a light-colored end table, such as the Avalone End Table, if your room has dark paint, or you may prefer a dark hue, like the Austin End Table, if you have other dark-colored wood in the room. Shape. 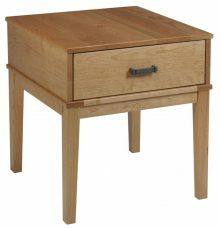 If you will be using an end table for your bedroom, a wider size might suit your needs. Try the Alpine End Table or Brady End Table in Oak. 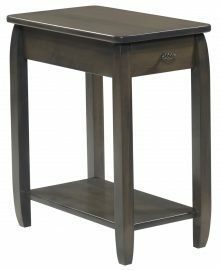 For a sleek Amish end table being placed in the living room, the Discovery Skinny End Table is an elegant option. Design. We offer traditional, matching and funky designs. The Cantilever End table is fun and unique, while the Cascade End Table has tapered edges that scream high class. Does My New End Table Need to Match the Rest of My Furniture? 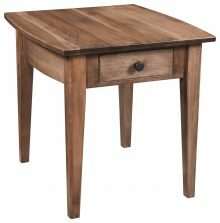 Sometimes you fall in love with a certain design, such as an oak Amish end table with drawers, but it doesn’t match the rest of your furniture. Should you buy the piece anyway? You’ll probably regret it if you pass up the perfect end table just because it doesn’t match what you have now. You can always use design tricks to help improve the match in the rest of the room. For instance, throw a tablecloth over an end table that’s a different grain of wood or use a new sofa cover to change your color scheme. Still, there’s only so much you can change through design. Eventually, you will want to match your new end table to your furniture, whether it’s going in the bedroom or living room. Luckily, we can help with that, too. Say you want our end tables in a certain shade of oak. It’s easy to match that to our other furniture. We can help you find the perfect bedroom or living room pieces to complement your new piece. We’re happy to recommend full sets or individual pieces as well. 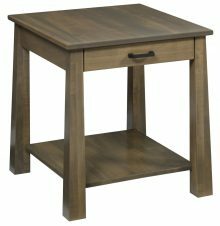 Where Should I Put My New Oak Amish End Table? Use your imagination. 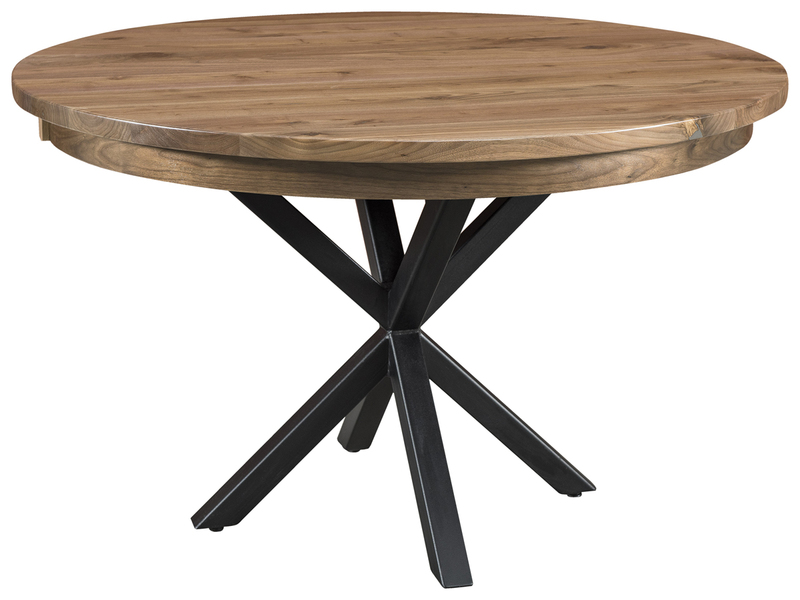 Our table can be the perfect place to wrangle up the kids’ video game console remotes in the playroom or a stylish alternative to cupboards in a laundry room. We’ve heard of many creative ways to use our oak Amish end tables. When you combine durable materials and superior craftsmanship with discounted pricing, you’re assured of getting the best value for your money at AmishOutletStore.com. 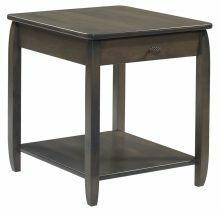 Purchase any end table today and get up to 33% off the regular retail price. You can also experience big-time savings by adding other pieces to your order to take full advantage of our large order discount. It’s a great way to satisfy all your home furnishing needs in the most cost-effective manner. 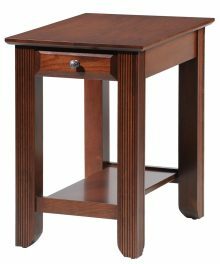 Browse our entire selection of handcrafted solid wood Amish End Tables right now!